Negative: The reagent pad with no distinct line means the alcohol content is less than 0.02% BAC. Note:� Reading the results may be made easier by placing the pad on a white background. Inappropriate consumption of alcohol can be a problem in many families, occupational, institutional and safety sensitive situations.� Alco-Screen� 02 is an easy yet effective tool for identifying alcohol consumption. This test can be used as a cost-effective method to help mitigate risk associated with inappropriate alcohol consumption. 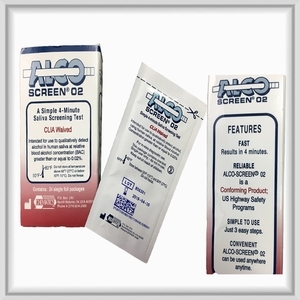 Alco Screen 02 has been tested and approved by the US Department of Transportation (DOT) for required testing of all transportation and safety sensitive employees for blood alcohol concentrations above the federally mandated zero tolerance level of 0.02%.